In our standard design pages, you'll find all of our own unique works of art. These are works that we designed and produce on a regular basis. Each item has a stripped-down base price shown - this is your starting point. You may customize any item to suit your needs. We have photos and samples of past items to help you imagine some of the possibilities. Walking sticks and canes are the image of style and refinement. Our customized canes are perfect for a night on the town or or for everyday use. Made using the same high-quality standards as our swords and knives, they are built to last. Starts at $325.00. Place an order! 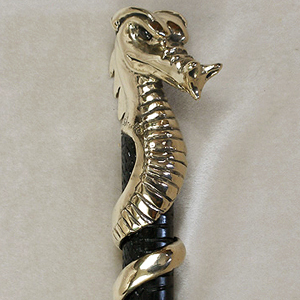 The curving neck and head of a dragon forms the handle of the cane. The sinewy handle meshes elegantly with a spiral Dymondwood cane body. A Walking stick based on museum examples of canes from the 1700's. Flowers and drapery cover this decorative head as well as the tip. The shaft is made from malacca wood (cane) just as it was. An eyelet is ready for a ribbon of your choice. Cane is designed to be taller but can be adapted to a modern cane height as well. Starts at $375.00. Place an order! 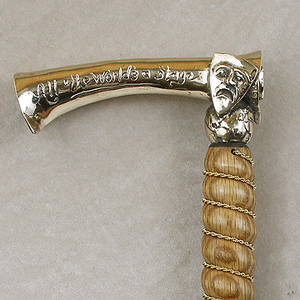 This cane bears the face of an old gnome with a long beard. His hat sweeps back to form the handle and fits comfortably in the hand. One of the very first canes we ever designed and created back in 1982. A creature is breaking out of and egg. The mold has long since fallen apart. Hatchling Cane is not available for sale. 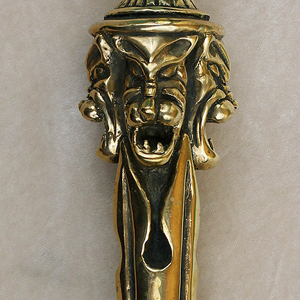 This is an example of custom, limited-edition design. 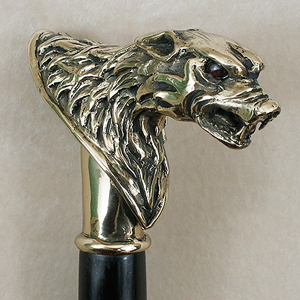 A classic style cane for. 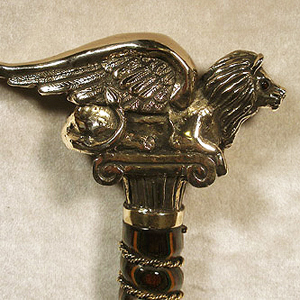 The cane head has four stylized lions around the top. This cane moves very well, the swing and balance are excellent. A mermaid arching backwards as if she were diving creates a comfortable curved cane head. The monk who could not carry a weapon, used this instead. It was not his hand which held the weapon. 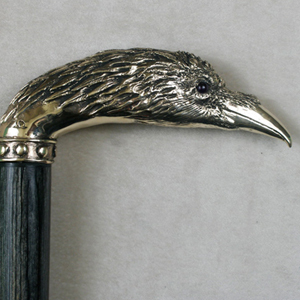 Detailed head of a Raven forms a solid comfortable cane head. This cane has a beautiful Rose growing up from the shaft and twisting to form the handle. Cast solid bronze, Delicate but sturdy. A dragons head at the top with it's sinewy body coiled down the shaft of the cane. Starts at $345.00. Place an order! A human skull, sculpted in detail and cast in solid bronze. A classic image for centuries. The eyes can be anatomically correct or slightly exaggerated to form a more sinister look. A very detailed wolf head with mouth open and teeth bared. A scroll creates the handle of this can. It rests upon a globe of the world with the masks of comedy and tragedy on either side. The Shakespeare quote "All The World's a Stage is written across the scroll. 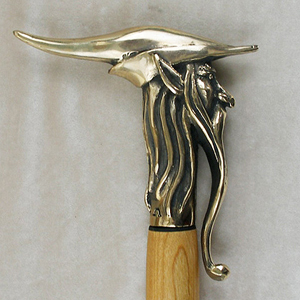 A graceful sweeping handle. Beautiful to look at and comfortable to hold. The Egyptian Was head. This is our version of the ancient Egyptian scepter. 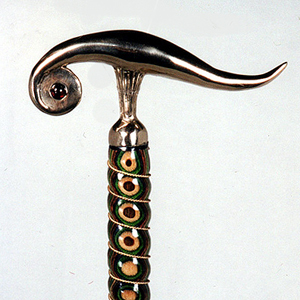 Re-created for use as a cane. you may choose type of wood and length. 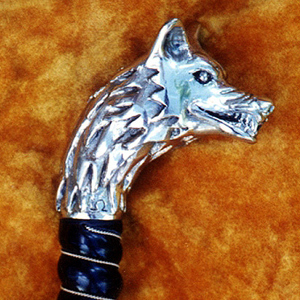 Stylized wolf head with teeth barred and ears back. Very comfortable saddle grip. Solid bronze head. Gemstones and silver plate are options. The emblem of Venice and symbol of St. Mark. The Winged Lion rests upon a pedestal. The wings fit comfortably in the palm of the hand. 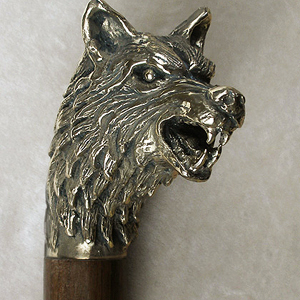 Cane has a wolf's head of solid bronze.